The photo above shows Aurora in mid construction. To lots of people I am sure this is just a photo of another building site. But to me and I hope to those who now enjoy living in one of best apartment developments in Melbourne, it represents much more. For those living in the Aurora, it is the early construction of what is now our home, our residence and even perhaps, our sanctuary. It is where we invite our friends, where we live a great portion of our lives and also our home always says something about who we are as individuals. But to me, this photo represents the building of a wonderful dream. I originally purchased the two sites that were to form the location of the future Aurora on the 22nd October, 1996. At the time this was a slightly brave thing to do with the intention of building a residential development as the residential property market was still coming out of a slump due to rising interest rates in 1994 and 1995. Also of course, St Kilda Road was known as a primarily commercial office precinct. Upon buying the development site, the first decision to make was whether to build a fairly bland and cheap residential development, the "square box with flimsy balconies" style or do something special, a cut above the rest ofthe market. There was one major residential developer in Melbourne that particularly specialises in the cheap end of the market. Most of their developments have the same square, bland, cheap and nasty look about them. I believed that this was an inadequate design solution for such an outstanding location. It was at this time that I was also lucky enough to meet one of the really great architectural designers here in Australia, Nigel Fitton, who had been a collaborator with another great designer, Nonda Katsalidis. Together Nigel and I determined that we would design and build something really special; a cutting edge building that would make a statement. It would be a high quality building but more than any other single issue, it should be a great place to live. There are many design issues in the Aurora that set this development apart from most others. Most are not obvious but they are there. For example, you will notice that almost every other apartment building of 60 metres (the general height limit in St Kilda Road) contains 20 storeys, but of course the Aurora holds 19 floors only. This is because we decided to put in higher than usual floor to ceiling heights. This of course gives each apartment an enhanced feeling of space and liveability, distinguishes the apartment design from the average and ultimately adds value and capital gain. The balconies are larger than normal and built into the apartment floor plates rather than hanging off the edge of the building. This means you can actually enjoy your balcony living space rather than being hit by a full force gale or suffering from a sense of insecurity typical of most other apartment balconies.The development is of course air-conditioned throughout from a central plant rather than the unfortunately too typical cheap solution of an individual air-conditioning plant located on individual apartment balconies. All the details of Aurora's design are far too many to fully describe here. Together they create a superior living environment. One of the very key issues in the design of a superior quality building is the type of construction used to build the development. 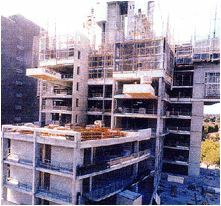 Most residential developments use a type of construction called "tilt slab' construction. This primarily means that the entire structure of the building is built up out of large tilt slabs of concrete. This type of construction is usually employed to lower construction costs. It also forces many compromises in the design. For example, in a typical, predominately tilt slab building, windows are usually smaller and are basically square holes in the middle of the slab, rooms tend to be smaller as the slabs need to be closer together to hold the building up, and there is usually complete uniformity of apartments through out the whole of the building, each apartment identical to the one above and below it. This creates the feeling of actually living in a box. With the Aurora building we decided that we wanted design flexibility, to allow larger rooms, especially the open living rooms, large wall to wall and floor to floor windows and a much greater variety of apartment sizes. It's more like creating a vertical village, rather than the typical apartment building. This design flexibility required a different type of construction technique to the vast majority of "square boxes' built around Melbourne. All of this requires extra expense but adds value in return. Most of all it requires more intelligent buyers and owners: you! The Aurora was designed from the very beginning to attract people who would recognise and appreciate a higher standard of design and building quality. People who would enjoy living here and in turn form a community in themselves. A friend, Peter, remembered 582 as being the work place for his first job in the 1950's. The offices were in a beautiful old house with a tennis court at the back and horse stables. There was a laneway at the rear and there was space in which cars could be parked. Peter had left school and got his first job as a mailing boy with 'Pink Pages' (the forerunner of today's Yellow Pages) who had their office in the building. Another gent, Norman, contacted me and moved the story along into the mid-late 1970's. He too came to work at 582. His employer, the Urban Development Institute of Australia, had a couple of the top floors of the then eight-story office building. Phil Ruthven, social commentator and economist developed and applied his economic models from his bunker in the basement. In her book "Melbourne's Grand Boulevard', Judith Buckrich indicates that in 1922 Victor Leggo lived at 582 St Kilda Road and was still here in 1939. In 1961 E.H. O"Brien Pty Ltd (advertising agents with ties to Pink Pages and Head Office at 414 Collins Street) were the listed owners. Next door at 580 St Kilda Road was the headquarters of the Australian Services Canteen Organisation which had previously been apartments in the name of Mrs Vera Bruce. On the south side at this time (1961) was the Zionist Office and Cultural Centre. Prior to that the site was owned by Joseph Nathan. On one of my walks around the lovely Albert Park Lake, I started to wonder about it's history. Monash University provided some interesting information. Prince Albert, after whom the park and lake was named, was the Consort of Queen Victoria. The parkland originally was swampy, grassed Yarra delta with sparse tree cover and with occasional lagoons, some quite large. The 'Lake' was one of those. The land was used for seasonal grazing, recreational hunting, rifle practice at the Butts (the original name of the Albert Park railway station) and for military training manoeuvres between the Victoria Barracks in St Kilda Road and the battery on Port Phillip Bay at the end of Kerford Road. In 1857 a railway line was opened through Albert Park from Melbourne to St. Kilda. A short-lived rail loop from Windsor to St. Kilda (1859-62) passed through the south of the parkland. On 22 July 1862 the parkland was temporarily reserved for sale and permanently reserved two years later. In 1875 the land between St. Kilda and Queens Roads was severed from Albert Park and sold by the government as housing allotments. In 1871 the Albert Park lagoons were used for boating and the Albert Park Boat Club was formed the following year. Between 1873 and 1880 the lagoons were excavated to form the lake and the excavated material used for land reclamation and embankments. The embankments were strengthened with timber piles and a promenade built. Municipal refuse tipping was also used for land reclamation and dairy cattle grazed by agistment. Fresh water from the Yarra River was connected to the Lake in 1890. During the early 1990's the lake was emptied to remove weed infestation and Melbourne Water assumed management from the local Committee of Management. In December 1993 the State Government announced that the Australian Formula One Grand Prix motor race would be held in the park and the first race was held in 1996. - So that is a brief history of our lake. Prahran Market is Melbourne's oldest market having opened in 1864, four years prior to the Queen Victoria Market The name 'Prahran' evolved from 'purraran' and is understood to be an Aboriginal word for 'almost surrounded by water'. The proximity of the Yarra River and the swamp to the south-west, with Albert Park Lake a remnant, explains the description Purraran was given as Prahran by Robert Hoddle, Government Surveyor, in 1840. Coopers History of Prahran reports that at the end of April 1864 an agitation started for the establishment of a market in Prahran. The Melbourne City Corporation had refused to reduce what the market gardeners regarded as 'exhorbitant' rates for selling their produce in the Eastern Market. Producers in the St Kilda and Prahran areas were also faced with a toll gate fee and six or eight miles of travelling to Melbourne and back. Consumers complained about the extra price put on by the suburban shopkeepers and the less than fresh produce after its trip in a closely packed cart. In 1864 the Prahran Council purchased some land for a market in Greville Street (now the Prahran Gardens) thinking the location would be a good site because it was near a railway station. The initial proposal was to experiment with holding the market in the street in Commercial Road, between Chapel Street and the railway bridge. On 14th June 1867 a public meeting affirmed the necessity of establishing a market. The actual site became the subject of a petty quarrel with an objection that the Greville Street site was too large. Eventually the market was established in Greville Street and Grattan Streets but it wasnít until 1891 that the present Commercial Road faÁade was built. After the 1914-18 war the market had become too small, so in 1923 it was renovated, enlarged with extra sheds and modern stables. All day cart horses stomped in the stables and no doubt their smells added to the odours of fresh fruit and vegetables, meat and poultry. I wonder if our own Percy, the horse reported in previous editions of 'Aurora News' as residing in Stable 437 here at 'Aurora' had ancestors from those days when the Salvation Army Officers regularly marched up and down the market aisles playing music. The Market has survived the Depressions of the 1890s and 1930s, both World Wars, the 1950 fire, after which arcades and the hall were rebuilt, and the flood of 1970. It also survived the political upheavals with in the Council. In 1994 the Council looked at selling off the market, but an overwhelming public backlash ensured the Marketís survival. In 1995 the Stonnington Council appointed an independent Board to run the Market. In 1998 the redesigned market opened after major renovations as it is today. - So that is a brief history of our nearby market. I was on the St Kilda Road tram when I started to pondering on how the south side of the Yarra might have looked since the mid 1830s shortly after Melbourne was established. The young township would have been visible on the rising land on the north of the Yarra, upstream from the mouth of the river near the Falls, where there was a reliable source of fresh water. The south side of the river would have been flat and prone to flooding. It was more suited to cultivation and grazing of stock and the lagoons, predecessors to Albert Park Lake, would have swept across to the sea. Small sailing vessels navigated up the then twisting Yarra to berths near where is now known as Elizabeth Street. The larger ships anchored at Williamstown. Freight and passengers came to Melbourne along the north side of the river. In the early 1840s a ferry service at Williamstown was available and the shorter track, on the south side was established through the marshy plain to the punt crossing at Melbourne (about where my tram is now going over Princes Bridge) Then during the Gold Rush Era of the 1850s and 1860s a makeshift, tent township sprang up on the south side of the river with the huge influx of new arrivals from the colonies and overseas. Being flood prone and vastly overcrowded it was not well suited to permanent occupation. The land here was cheap and well located to Melbourne so after the Gold Rushes, in 1870s and 1880s, factories and housing for the workers were established. After the 1890s 'depression' and through to 1920s the area south of Melbourne prospered with the combined growth of industry and population, with housing and recreational facilities expanding. It is only in recent times that the factory buildings on the very edge of the Yarra have disappeared. The bluestone remains of the wharf area can still be seen and it is not so hard to try visualise the old scenes. As the tram bell 'dings' and we move off, I wonder what the Grand old Railway Station is thinking as it watches from its prominent vantage point across the river. What are itís thoughts, silent opinions and contemplations of all those changes it has seen over the years. What of things as they are now - the Southbank complex, The Casino, the Arts Centre, Federation Square and the Gallery? What changes will the future bring?